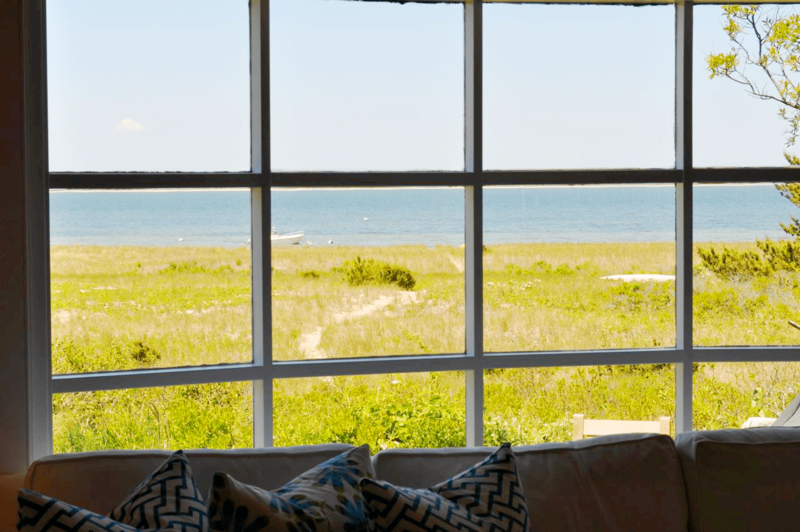 NANTUCKET NATURAL – ISLAND OUTDOOR COLORS INISDE A SMALL BEACH COTTAGE! Remember when I told you last week that best of friend FF invited me to Nantucket again this year to hang out with her and her husband CCF and her son CGF (who also doubles as my god child) and the rest of her family for a weekend in July? I regretfully had to decline due to work trips surrounding showing the COCOCOZY furnishings collection in both Atlanta and New York. Much regret was involved in declining the invite…much regret. Oh, and I had also wanted to see the COCOCOZY collection at the Lion’s Paw on Main Street in Nantucket – that posh furnishings store is carrying the line. Now I need to face reality though…am not going to Nantucket this summer…I am not going…(boo)…I am not going (it’s okay)…I’m not going (I’ll be fine)…I’m not going (chin up, lots to be grateful for)…I am not going (picking self up off the ground)…I am not going to Nantucket this summer (waaaaaaaaaaboooooooohoooooo). Okay…I have had my meltdown…time to move on. Sorry you had to witness that…LOL! Well I can’t be in Nantucket but I can still enjoy all things Nantucket. Specifically, I am totally enjoying this lovely little cottage from talented interior designer Lynn Morgan who worked with Brooks & Falatico architects on the project. 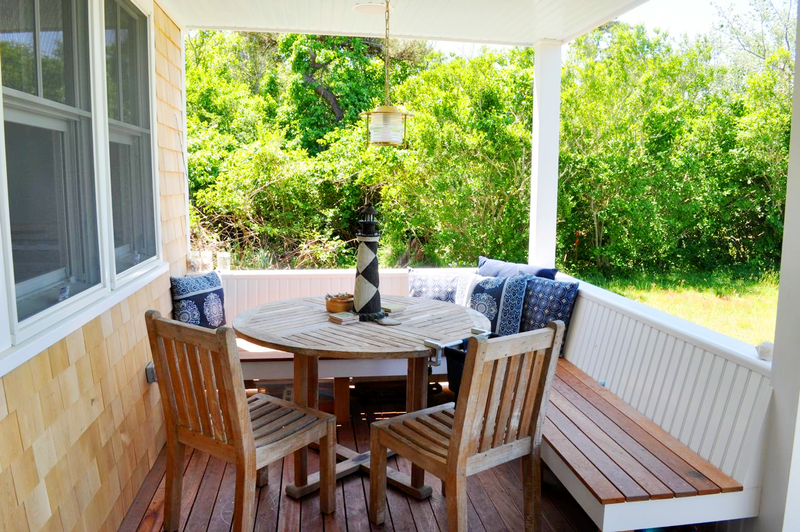 This tiny renovated guest cottage is in the back of main house in the Wauwinet area of Nantucket. It is oh so perfectly small with oh so wonderful views. 2 bedrooms, 1 bath and a view. Perfect vacation spot. 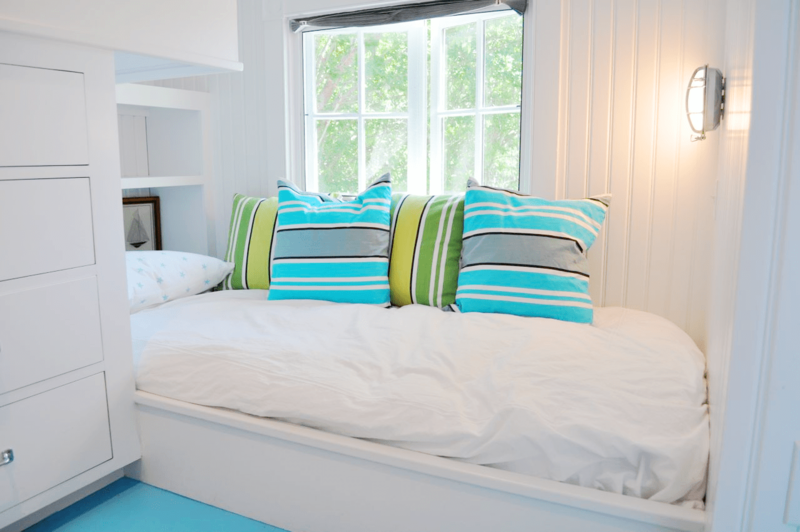 In the design, Lynn literally took the vibrant outdoor blues and greens and transported those hues right inside. Lovely turquoise and apple green bursts of color against a white background! The turquoise Moroccan poufs in the living room, the awesome Sea Bouquet-Bamboo fabric by Susan Harris for Lee Jofa fabric on the upholstered club chairs, right down to the glass dishware in the kitchen cabinets – all in tones of fresh blue and bright green brought right in from the outdoors. Some things to note in this design…loving the glossy white lacquer floors in the main living spaces and the turquoise blue lacquer floor in the bedroom. 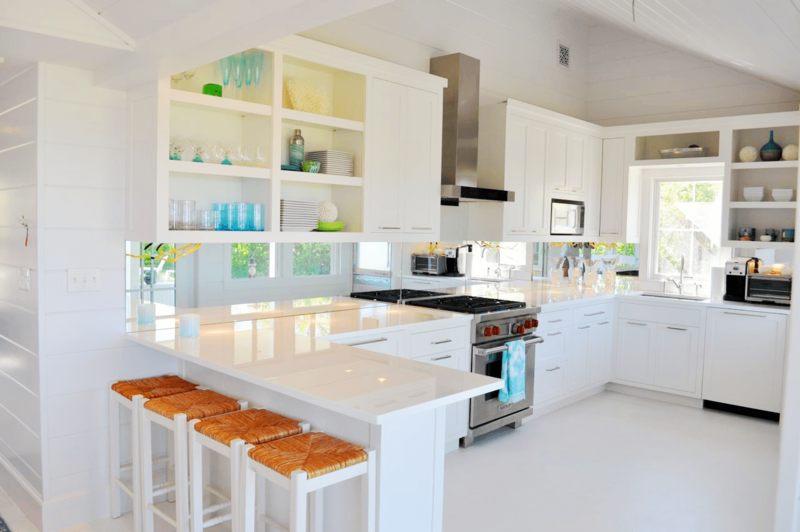 Also, note the design trick in the small kitchen…a mirror backsplash to give the illusion of making the space bigger! Oh, and must love that over sized white sectional sofa that wraps around an entire corner of the living room….very nice…wouldn’t mind throwing off my shoes there, grabbing a good book (if only I had time for a good book these days) and taking in a good look at the wonderful ocean view. What do you think of this little Nantucket nest? Could you see yourself being a guest in this small home? What do you like? What might you add or subtract? Do weigh in! Thanks to Lynn and Calla from Lynn Morgan Design for sharing these photos! P.S. COCOCOZY PRESS ALERT: The latest issue of Lonny Magazine is out! It is wall to wall gorgeous design and decor and it is quite fabulous! To add wonderful to fabulous, COCOCOZY home textiles collection (bedding, pillows and throws) is featured on page 38 of this July/August 2011 of Lonny! Yippeee. Woohooo! Hip hip hooray! Uh huh uh huh! Whoa! Wow! Yoohoooo! Can you tell I’m excited? Lonny is such an amazing shelter magazine…I am honored and thrilled to have my collection be on its pages. A huge thank you to Lonny Editor-in-Chief Michelle Adams for including me in the mix. Also, a warm thanks to Lonny’s Senior Writer Shawn Gauthier for the nice write up and to Editorial Assistant Kari Costas for facilitating all. This latest Lonny issue just came out yesterday…it is awesome…pure eye candy for those of you who love a good interior design magazine read! Check it out! P.P.S. COCOCOZY PRESS ALERT 2: Quelle jour! Just right now (11am PST) found out about more positive press that came out today. What a day…counting my blessings as I write this…really. So the latest news is that COCOCOZY has been named in the Top 6 Sites for Interior Design Inspiration list on My Life Scoop. My Life Scoop contributor Alice Yoo of My Modern Metropolis picked her top favorite design sites and COCOCOZY was named #6 on the list of design blog giants! Alice also calls me “mysterious” in her write up. I love that! Hope you have a good day too! LOVE, LOVE, LOVE IT. Being as crazy for white as I’am, I sometimes wonder if it isn’t to much!!! I mean the furniture of my entire house is white and a don’t regret it, from the Kitchen, to the bathroom cabinets, white. And houses like this give me butterflies in my stomac. I really love it! Coco, I am so sorry you could not go on the trip. The other side though is that your business is booming!! I am so excited to take the time later today to read Lonny, congrats!! 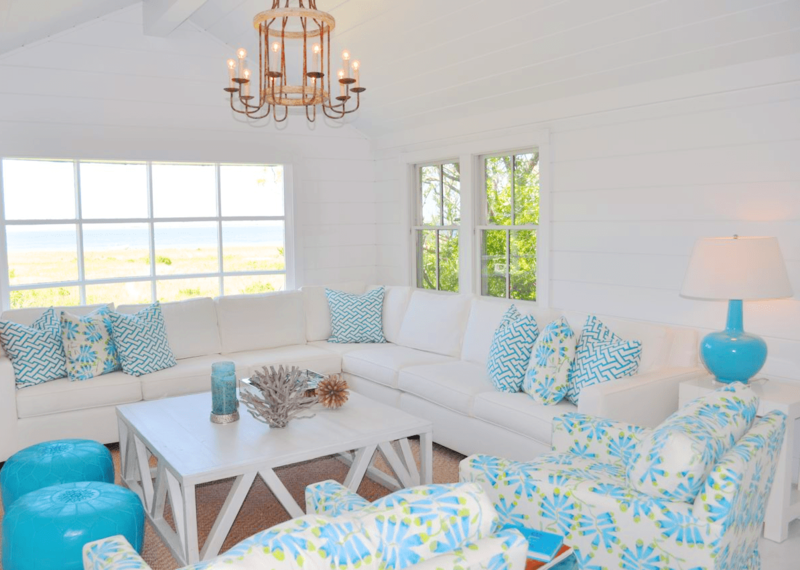 The nantucket cottage furniture arrangement is so helpful for those of us who are not trained in design….So much more seating can be comfortably installed in a space than we’d think…..can’t wait to share.. 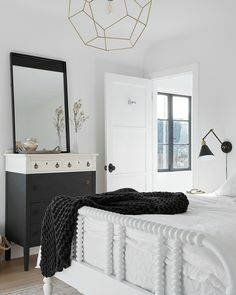 I love white, mostly because it’s a pipe dream for us! We have three dogs…. I’d love to have breakfast on that deck, so cozy! Great house, do they have any of your patterns in there? Beautiful home, beautiful pictures. I do like the poufs or small ottomans in the living room-where are they from? And the big bright lamp? I love Nantucket and this place is simply gorgeous!